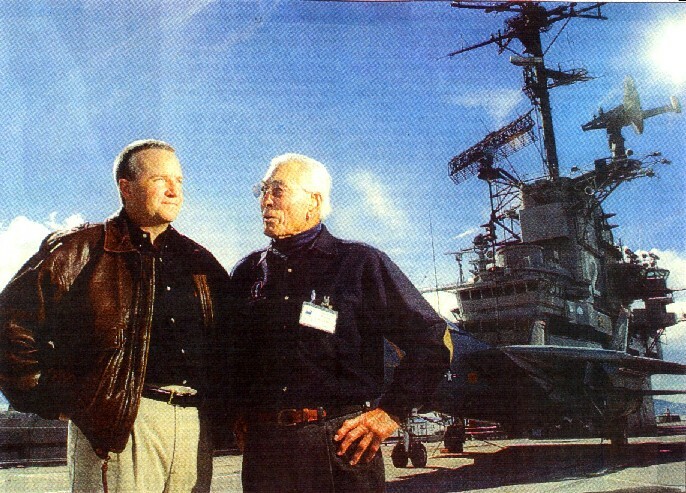 LAWSON SAKAI, right, head of E Company, 442nd RCT, and Scott Armanini, CEO of the USS Hornet Museum, stand on the flight deck of the USS Hornet in Alameda on Feb. 18. The Regimental Combat Team will create an exhibit on board. It's one of the most important stories there is. It's the story of perseverance, patriotism, idealism, and loyalty — in short, the story of core American values. And it's going to be our honor to tell it." Two real-life legends of World War II will join forces next month when the aircraft carrier USS Hornet unveils a permanent exhibit honoring the 442nd Regimental Combat Team. The Hornet, now a floating museum docked at Alameda Point, is a veteran of some of the fiercest battles of the Pacific war, including Okinawa, Iwo Jima, and Leyte Gulf. She and her aircraft shot down 668 enemy planes, destroyed another 742 on the ground, sank 1,269,710 tons of enemy war ships, and survived more than 900 kamikaze attacks. Twenty-five years later, she was the ship that plucked Neil Armstrong, Buzz Aldrin, and Michael Collins out of the ocean after their historic Apollo 11 flight to the Moon. The 442nd RCT was a segregated Japanese-American Army unit that won fame in Europe, where it became the most decorated unit, man for man, in U.S. military history. While suffering 314 percent casualties, they earned more than 18,000 individual decorations for bravery, including 21 Medals of Honor and 9,500 Purple Hearts. In April 1945, they breached the formidable German Gothic Line in Italy in less than a day, after it had held up other American troops for more than six months. They penetrated the enemy defenses with a daring night attack, climbing a 4,000-foot near-vertical mountain. In the fall of 1944, they fought bitter battles in northern France, liberating three key French towns, freeing 3,000 Resistance fighters scheduled for imminent execution (including a teenager named Francois Mitterrand, who grew up to become president of France), and rescuing the "Lost Battalion." They were also the soldiers who broke down the gates of the infamous Dachau concentration camp. And they did all this while their own families were imprisoned behind barbed wire in American detention camps, where Japanese-American citizens on the West Coast had been deported beginning in 1942. Many of the soldiers were in the camps themselves when they volunteered to serve. "It's one of the most important stories there is," said Scott Armanini, CEO of the USS Hornet Museum. "It's the story of perseverance, patriotism, idealism, and loyalty — in short, the story of core American values. And it's going to be our honor to tell it." But what is a tribute to an Army unit doing on a Navy ship? "Not too many people know it, but about 6,000 Japanese- Americans served in the Pacific war as members of the Military Intelligence Service," Armanini said. "They interrogated prisoners, translated captured documents, and persuaded enemy soldiers to surrender. They were so good at it, Gen. MacArthur said, `Never in military history did an army know so much about the enemy prior to actual engagement.' This ship was the direct beneficiary of that intelligence. Without it, who knows if she would have survived?" The exhibit will be curated by veterans of the 442nd RCT and their support group, Friends and Family of Nisei Veterans. It will cover not only the war years, 1941-1945, but also the detention camps and the postwar years. "The sad thing is that even after they came back with all those medals, they were still treated like dogs," Armanini said. "But they overcame that, too, and went on to wonderful lives and careers." a small preliminary exhibit next month, followed by a much larger permanent exhibit later this year. "Our goal is to have the whole thing installed by October, in time for Fleet Week," said Lawson Sakai of Gilroy, president of the Friends and Family group. Sakai, a veteran of the 442nd's 2nd Battalion, Company E, was awarded four Purple Hearts during World War II. Sakai's group is trying to raise funds to cover the cost of installing the exhibit, which he estimates at $7,500. "Of course, all the labor will be free," he said. "But we still have to pay for materials to build the display cases." The group is also asking 442nd veterans and their families to search their attics for artifacts and photos, which will become part of the permanent collection aboard the Hornet. Those wishing to contribute funds or artifacts can e-mail bshiroyama@yahoo.com, call 408-776-0361, or write Friends and Family of Nisei Veterans, c/o Brian Shiroyama, 14724 Excalibur Drive, Morgan Hill, CA 95037. Reach Martin Snapp at 510- 262-2787 or email msnapp@cc­ times.com. An interesting side note...on the hanger deck of the HORNET, there is an Airstream trailer that was the quarantine capsule that housed Astronauts Armstrong, Collins and Aldrin from their Apollo 11 mission to the moon in 1969. It was NASA engineer John Hirasaki from Houston, Texas who designed it and volunteered to stay inside with the astronauts for three weeks. John Hirasaki, by the way, is the cousin of Mineko Sakai of Gilroy!